1.The case is presented by the trainer and the participants judge the cause of the case by asking closed questions. 2.The trainer is only responsible for the question of the trainee, but can only say "yes" or "no". A couple on a balloon expedition in the vast desert, unfortunately on the way hot air balloon fuel shortage, need to reduce the weight of the balloon, the couple tried everything to throw everything can throw away, even including clothes, but this still can not solve the problem, finally, the husband for his beloved wife to escape from the sky, he gave up his life, jumped out of the desert to die. Purpose of the activity: Learn how to judge a thing or a person by excluding irrelevant things and focusing only on relevant grounds. Give the student a blank sheet of paper with a blank triangle painted on it. 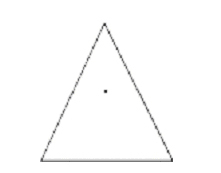 Please draw a point between the top and the bottom of the triangle. Then show a correct sample sheet. Please use the ruler to check the correctness of your drawing. 2.Does the game show that in real life we tend to think differently? 3.How can we overcome or prevent this? 1.The trainer distributed the above mentioned materials to each group and then asked the trainees to put down the eggs at the designated location on the third floor after 25 minutes. In order not to break the eggs, you can use the materials given to design an umbrella. 2.2.25 minutes later, each group of students in a 3-storey high place to put eggs, other students can go to the ground floor to watch and check whether the eggs dropped intact. 3.The egg intact group is the winner group, can carry on the final, the winner, the trainer can give some small gifts as a reward. How did your group come up with the idea? How well coordinated is everyone in the group process? Students are required to choose one of them to act as a girl. Other students assist in providing props, image design, footwork training and so on. There is a certain time limit. Must be good at imitation, grasps the key point to carry on the imitation. Imitates the successful personage to follow the same principle, must grasp the success key factor to carry on the imitation. Select the largest and heaviest cadet among the cadets and ask him to sit on one of the seats on the podium. Also select four of the leanest cadets and invite them to the podium. Request: The four leanest cadets should work together to lift the fat cadet in the chair for at least three minutes, but each can only use one or two of his own fingers. Purpose: Telling students that their innate thought patterns prevent them from learning new things. 1.Show the nine dots (shown in Figure 1). Draw the nine dots on your own paper. Then use your head and connect the nine dots with only four connected lines (each line must be coherent and not overlap each other). 2.Give participants a few minutes to try everything. The key to solving the problem lies in breaking the square formed by the nine points in the mind and expanding outward. After the student completes the above task, ask them to use only one line to connect the nine dots this time. Answer 1: Fold the paper so that the three lines where the dots are very close, and then use a thick pen to connect the nine dots one at a time. Answer 2: You can easily connect the nine dots one at a time with a large brush. *How does this exercise inspire our training and work? Case: Case: A man went to a cabin by the lake. After talking to a stranger, he jumped into the lake and died. 2. The trainer is only responsible for the question of the trainee, but can only say "yes" or "no". One summer night at the lake, a couple of loved-up lovers, because of the hot summer night, the man went to buy drinks to quench his thirst, leaving the young lady waiting by the lake.Fifteen minutes later, when the man came back, he found that the young lady was no longer in the same place, so the man called out her lover's name around the lake, and no one returned.As the minutes passed, the man became more and more worried, and an ominous foreboding was already hanging over him.With a thud, the man jumped down into the lake and searched for his lover's footprints. He fumbled at the bottom of the lake for a long time and found nothing, except something like water grass, and, fearing that it would be dangerous, he gave up and looked for the bottom of the lake.In the dead of night, the man dragged his weary body along the lake in search of it, when he saw a lighted cabin by the lake, and knocked at the door, which was opened by a strange old man. "You didn't see a girl with long hair and a red skirt, old man?" Still a glimmer of hope, the man told the stranger exactly what had happened to his lover, including what he had been looking for in the lake. Originally, the man in the lake touch is not water grass, but her lover's long hair. So, the man jumped into the lake martyrdom. Has anyone played with this? Not that we swallow nails, please rest assured. Please put 12 nails on the head, can not touch wood, brain teasers answer is not necessary. Possible and impossible is one of the answers, consensus is good. In addition, explain that the nail box is just to install nails convenient, there is no strange, you do not need to study. 2.Is it possible that you will be affected by someone else's words? 3.Or do you think it's impossible, so it never has a chance? 4.Does one sentence make others feel impossible? Objective: To give students the opportunity to practice creative problem-solving. How it works: Research shows that creativity can be nurtured through simple, practical practices.Most of the time, however, innovative ideas are stifled by words like, ' This is what we tried last year or this is what we've always done. With these basic concepts in mind, the team was divided into groups of 4-6 people each. Their task was to figure out the purpose of the paper clip as much as possible in 60 seconds (and possibly any other item or topic). Each group assigned one person to record the number of ideas, not the ideas themselves. After one minute, each group was asked to report the number of ideas they had, and then cite some ' crazy ' or radical ' ideas' that often proved to have meaning. *What kind of concerns do you have when you are brainstorming? *What problems do you think brainstorming is best for? *What can you think of now where you can use brainstorming at work?